On May 10, Bolivian President Evo Morales inaugurated the country’s first natural gas liquids separation plant in Rio Grande, Santa Cruz. The historic event, said Morales, marks a turning point in Bolivia’s hydrocarbons history and the start of a new era: Bolivia’s industrialization of gas. It’s also a reminder of the challenge posed by Brazil to Bolivia’s quest for industrialization. Separation plant, Rio Grande. 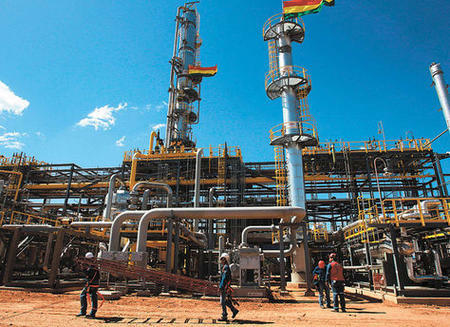 Source: EFE/ La Razón.Since nationalizing the sector in 2006, Bolivia has earned more than $16 billion in hydrocarbons revenues, as compared to just $2 billion from 1999 to 2005. Natural gas production has nearly doubled, from 35 million to 60 million cubic meters per day. Still, the growth of Bolivia’s hydrocarbons industry has been based on the export of raw materials, without the added value resulting from industrialization, which has proved difficult to accomplish. The separation plant will allow Bolivia, for the first time in its history, to filter out valuable liquid hydrocarbon components—such as propane, butane, ethane, and gasoline—before exporting its abundant natural gas to other countries. The virtually free giveaway of these products has greatly benefited Brazil, which currently imports around 53% of Bolivia’s natural gas, and Argentina, which imports 27%. For Bolivia, this practice has been costly. Since the late 1990s, Bolivia has had to import gasoline, propane, and other hydrocarbons fuels to meet domestic demand, paying the market price and then subsidizing the cost to industrial and residential consumers. The government’s tab for hydrocarbons subsidies currently exceeds $1 billion a year. 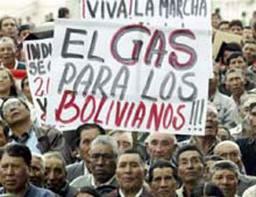 According to government officials, the new separation plant will make Bolivia more than self-sufficient in the production of propane gas. The surplus will be sold to Paraguay, generating an estimated $520 million in additional revenues over 13 years. State hydrocarbons subsidies will be reduced by up to $200 million per year. While Brazil's role as the major consumer of Bolivia's gas has been critical to the growth of the sector, it has also posed a significant challenge to Bolivia's goal of industrialization. Under a 20-year contract executed by former neoliberal president Gonzalo Sánchez de Lozada (Goni), Bolivia is obligated to export a minimum quantity of natural gas to Brazil until 2019, at a relatively low price. In a contract amendment negotiated with Morales in 2007, former Brazilian president Luiz Inácio da Silva (Lula) agreed to compensate Bolivia for the fractions of liquid hydrocarbons present in the gas that Brazil receives, but only above a certain level. This effectively reduces the volume of gas that can be subject to separation in Bolivia. Meanwhile, Bolivia is seeking retroactive compensation from Brazil for the “excess” liquid hydrocarbons delivered in its natural gas exports since 2007, in the amount of $80 to $100 million per year. And Bolivia will continue to export “rich gas” (mixed with liquid hydrocarbons) to Argentina until a second separation plant is completed in the Gran Chaco region of Tarija, scheduled for October 2014. As a further step in the industrialization process, Bolivia is building plants to produce urea and ammonia in Cochabamba, liquid natural gas in Santa Cruz, and ethylene-polyethylene in Tarija. Concerns have arisen that the hydrocarbons extracts required to develop these products will not be available in a timely manner, given the status and capacity of the separation facilities and Bolivia’s long-term contractual obligations to Brazil. Analysts also warn that these export commitments may jeopardize Bolivia’s ability to satisfy its growing domestic energy needs, especially since its proven gas reserves have turned out to be smaller than anticipated.